I’m about to go on a 30-No-Shopping Challenge to not only curb my spending but to save up for a potential move. I’ve been doing a lot of shopping lately and while I have to say I have excellent taste and can spot a bargain, I am not quite happy with the fact that I’m not saving more. I’m bleeding out the funds that should be socked away for an expensive post-graduation life. 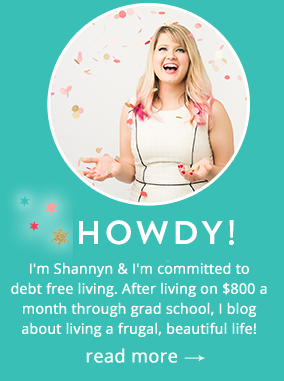 Here’s what I’ve come to discover…beyond the surefire signs of an out of control credit bill/spending more than you earn, there are some subtle signs and trip-ups that are leading to an out of control budget. You subscribe to 5+ retail emails and find yourself clicking several a day when you check your inbox. When you feel bored or have nothing better to do you spend your time perusing shops online. If you’re in an area you’re unfamiliar with or have time to kill your first thought is to go shopping. When you’re visiting a new city you’re most excited about the retail selections. Your keychain and wallet are heavy with loyalty cards or retail credit cards. Your biggest spends happen after a major event- either joyful or stressful and you’re ready to spend. So, is that you? The problem with out of control spending is that it totally creeps on you over time. While sometimes it can be the result of a trigger (death, stressful situation at work, income boost) many times we slowly but surely subject ourselves to shop-inducing stimuli that gear us to spend. Most of the “shopping sprees,” happen after a crazy event and are easy to spot, but the slow budget-busting bad habits come on a daily basis when we’re snared by enticing emails or impulse inducing 48 hour clearance sales. It may be difficult, but unsubscribe to the retail emails- especially the really tasty ones that offer limited time sales. Toss catalogs before you even peruse them: only shop the sales or go shopping when you know what you want to buy. Carefully examine how you spend your time, what are you triggers? Do magazines, tv shows & blogs influence you to spend? Go through your living space & purge. Seeing everything you’ve accumulated already can be a sobering wake up call. Sit down & set priorities- what is it you really want? Would one key piece be better than a bunch of impulse buys? Reframe your downtime: if you’re feeling bored or unsure how to spend your time insist on making memories, not purchases! 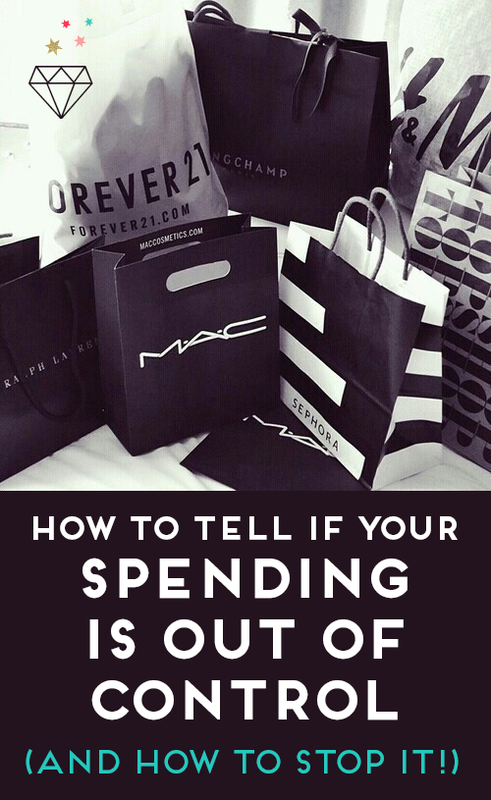 Have you ever caught yourself in an uncontrollable spiral of spending? If so, how’d you catch on and how’d you stop it? Because You Rock…I’m Doing A Giveaway! Dress to Impress: I’m Graduating! Great tips, I love them. It's very true that most shopping or expenses get derailed after a specific event. Emotional shopping is something we need to be mindful of and your tips will help anyone who needs to pony up and stop the train before it veers off track. We started a no-shop week in 2012 and so far so good. We call it The Grocery Game Challenge on my blog. We have players that post their shops along with ours each month but the point is to be mindful of your budget and how much you are spending. We do what you suggest by not even looking at the weekly flyers if we can help it and toss them in the bin. If you look you are tempted, if you go to the mall, you are tempted. Focus on other aspects of your life during this week that you might have put on the back burner like some free exercise by going for a walk etc.. -Toss catalogs before you even peruse them: only shop the sales or go shopping when you know what you want to buy. Great Post and Good luck socking away your money!!! Thanks so much for the fabulous comment…my dad is Canadian so I'm sending you a big high five! I know I did a ton of shopping after my Gram died- I hadn't been to a store at all during her illness and passing that after she left us I went off the shopping deep end- it was a way to reinvent myself so I bought sooo many clothes, it was nuts! I did a 30 day No Shopping Challenge last year and found that it was far easier if I just avoided the stores and malls- less chance for a slip up if I didn't go or get exposed to all the shiny expensive things! It took me two tries but I got it! Thanks for your awesome comment, I'm going to go check out your blog! I finally had a chance to check out your Twitter today, came here, and was excited to read about your potential move to NYC. I've been here for almost six years, and while about half of my blog posts are about wanting to beat up everyone on the subway, the other half are about how it's so incredible, so incomparable living here. Good luck in your decision! Hey Katie! I think NYC would be a fun adventure, I'm just worried about funding and the logistics of making it happen. I know I could always afford rent and utilities no matter what, but I'm worried that I'll blow through my money with all the great opportunities for food, festivities and entertainment. Rent seems to vary from neighborhood to neighborhood and it seems totally competitive to find a place..I'm such a newbie! I should really write a blog post about finding an NYC apartment, having moved as many times as I have. My number one piece of advice would be: if you can afford it, you can't live there. If it's affordable, it's either inconvenient or unsafe or a scam. And you're right about it being competitive; if you see it on craigslist, 9 times out of 10, it's already been rented, or it's just a broker trying to rope you in with an apartment that doesn't exist. And yes, I basically blew through my life's savings in my first three months here. But who cares! https://nabewise.com/nyc/neighborhoods might help you figure out what neighborhood is right for you. Thank you Shannyn for this post! As I mentioned on twitter, I linked this up to my latest post as well because I am preparing to move in August, and I will be jobless. It's a scary though so I have decided that I absolutely and desperately need to stop spending on unnecessary things. For me, one item can be all it takes to open the flood gates for more spending. If I see a cute top or even a book… it will be easier to spend more. I also like to browse online when I'm bored, and I need to stop doing that! Wow. This sounds exactly like myself. I think the first step to "recovery" is unsubscribing from all those evil emails I get daily, like you said. I wake up EVERY MORNING to at least 15 emails on my Blackberry from retail stores, groupon, etc. Blogs have been a major influence on my poor spending habits too… I'd say that's what's made it become this bad! Really good post. I am not like this but it is good to know. Thank you for those tips, they are so great and so true! Great article!!! Thank YOU!!!!! Great blog…thanks for all your giveaway! I was a major shopaholic in my pre-kid days – especially clothing and accessories. Once I had my kids, though, I really had to rein everything in. Now, I get a buzz off shopping for kid necessities like diapers and sippy cups. It was all about transferring emotion for me. These are such great tips. I had a shopping problem mostly because things were relatively inexpensive. But when I had to move to a smaller place, I was forced to let go of so many things that I had loved at the time but I had never used. Now that I'm living on a very tight budget, I have learnt to check whether or not I really need what i want to buy. I can't control myself when I step on shopping malls, I buy what i want it. Shopping and dating is only my hobby, meeting with the boys and chatting. These are really helpful tips to keep spending habits in check! I’ll definitely put this list to use.